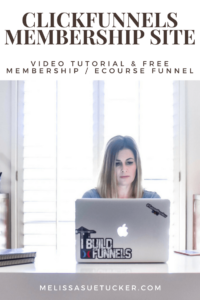 In this ClickFunnels Video Tutorial, you’ll learn how to create a membership site that can also be used as an online course. If you are not already a ClickFunnels user, this clickfunnels membership site template will give you 2 weeks FREE access! Melissa: In this video you’ll learn how to create a membership website or interchangeably an online course. Laura: Alright, funnel friend. So we’re going to log in to ClickFunnels here and we’re going to talk about what we talked about yesterday but didn’t capture on video, which is around using ClickFunnels to actually make a membership site or it’s like a course. Melissa: I had no idea we could do this! This is crazy! Laura: Yeah, and it’s for the regular priced version so if you get ClickFunnels it’s ninety-seven dollars a month. Oh hold on, I’m trying to log into the right one. So it’s ninety-seven dollars a month and that includes what we’re going to show today. Melissa: No, but stop! You have two weeks for free that you can test this out and run Facebook Ads to it, if somebody wanted to create their course. And a lot of times you can create a course or a clickfunnels membership site in a few hours. If you already know your business and what you’re doing. Laura: Exactly, and we’re going to share what we make today so that you can just jump off of what we have started and it’ll save you some time. Laura: If I could just log in. I swear logging in and passwords are like the bane of my existence and I use, oh my god, I use LastPass but it never works. See, oh my god. Ok.
Melissa: Well if somebody watching wants to create a password protector like autofill thing that actually really works when you have to login to the same accounts with multiple, or the same thing with multiple accounts hit us up, we’ll beta test it for you. Melissa: I know, this is this happens to me with my gmails and my Google accounts all the time. Laura: I know this is like drives me so crazy. Okay, let’s see if it actually works. It changed the password, let’s hit sign in see if it actually works this last pass. All right, yay! Ok, so this is an account that I haven’t built a million things out with yet, but we want to show you what it looks like if you wanted to build a membership or a course. Okay so what you do is, once you’re logged in…and like Melissa said you get two weeks for free so you could just try this out and see if it will work for you. So you click on new funnel, and then click the middle one that’s sell your product, and then you’re going to pick the last one right here which is membership. And then, what should we call it? Melissa: Let’s call it, eCourse Funnel? Laura: Ok, or what about… what are we called again? Laura: Funnel friends membership course template. How about that? Melissa: Oh, I love it. Yeah, I like the F & F in funnel friends. Laura: Yeah, me too. Ok, so you make a name and it can be anything you want, and I don’t think anyone’s going to see that other than you so it can be whatever name you like. A then you hit build funnel and it takes a few minutes for it to process. Let’s see if it’s showing up anywhere? Ok, so now it’s processing. Awesome. Melissa: So that name is on the link, if you see that at the top. Melissa: If you see at the top in the link to this funnel? Yep, so the funnel friends is up there. Laura: Right. Ok, yeah. And this is something you can actually change which we’ll have to do completely another video on. Laura: You can change it like just a little bit like what comes at the end and you can also do a custom domain so it actually says, it won’t say the ClickFunnels in there. So that’ll have to be another video because that’s a whole other topic. Melissa: I didn’t even know you could do that! Laura: Yeah. Oh my gosh, ok cool! Well, write it down. We’ve got to do that on another video. Melissa: Ok, I’m writing it down! Laura: Ok, but just for now we just want to show how to build the actual membership site. So when you select that type of a funnel then you have these templates inside for membership access and then membership area. So access is where people actually log in. And then the area is what they’ll see once they are logged in. So those are set up as two different funnel steps for you to edit. Laura: So ok, I don’t know if right now is the time to talk about it or not. But, we also want to add in two steps before this. So we want to have a sales page and we also want to have an order form so people can actually buy it. Unless you’re making something for free, then you don’t have to add this at all. You could just have those two things and if you’re just driving people to that from your website or whatever then you don’t even have to. Laura: Actually, if you have like a sales page on your website where it talks about what course or membership you’re selling you don’t have to build this either you can just send them right to an order form. Laura: So I want to drag it to be at the top so that’s why I just did that, and it says it’s going to reset my statistics is that okay, and yes I don’t even have any statistics since it’s brand new. Ok, there it goes, now it’s letting me move it. Yes, yes. Melissa: I love how easy it is. Laura: Yeah, once you get the hang of it. There’s a little bit of a learning curve but it definitely is a lot easier than other stuff that I’ve tried in the past. Melissa: So we can have the sales page and then we can also have the order form. I was just going to say, people can pay right from ClickFunnels, too. Laura: Oh yeah. That’s one of the benefits I think of using ClickFunnels is you don’t need another separate payment thing that’s completely different like you don’t need a CM card or Gumroad or other things like that, or figuring out coding on integration. So they have an area in ClickFunnels which is the topic of another video, too, on how to get it set up. But i personally use Stripe or you can use PayPal and it’s pretty fast integration here in click funnels that you can actually take money right from your funnel steps. Melissa: Is it not wanting to go? Laura: Yeah, I think it’s just..
Melissa: It needs to think for a second. Laura: Ok, so once it actually moves then what we want it to be is sales page, then order form, then membership access, then membership area. And each of these funnel steps have different templates that are associated with it, so for the sales page we’ll start at the top. Once that loads then there’ll be different sales page options that you can pick from and then you can just enter in your own text and images to make it your own. Also, if you make some edits, you can save whatever you have as a template so that the next time you make a sales page it’ll already have all your branding and things on it and you don’t have to recreate the wheel again. Melissa: What I love about ClickFunnels too is they spend so much money in their research, so they know that their pages are optimized and are good at converting. You don’t have to be an expert at putting it together. Laura: So here are just some really basic ones where you just want to get people to go to the next level. Let’s see, we’re doing a membership so what looks good? Melissa: I love something with a little video explainer, although we don’t have to do that. Laura: I was going to say that, too. Melissa: Yeah! The greens fun. Green and orange? Melissa: What do you think? The other cool thing is if we pick one that doesn’t have a video on it you can always add a video, right? Laura: Oh, for sure, yeah. You can add anything. Oh, here’s like a two-step video opt-in. Maybe I’ll just click this one since it’s the top one. Let’s see what it looks like. And it looks kind of simple. I personally like light colors in the background, I don’t really like dark colors for my own personal stuff. So that’s why I was kind of avoiding the other one this is like a dark gray in the back. I like text that’s black versus text that is white. Melissa: I agree with you. It’s easier on the eyes I think. Laura: Yeah. So if you click on this you can edit it here’s a little tip, if you’re on a Mac you can hold down command and then click it and it’ll open it in a new window. It’s just the same thing as right clicking. But if you click this to edit it, it’ll go away and I like to have my steps separate from the page I’m personally editing. That’s just like a little workflow thing. Melisa: So that was command and then click the edit button? Laura: Just a normal click, yeah. If you hold down command you can just click on anything and it serves as a right-click. Because I don’t use a mouse, so I just use my trackpad. Melissa: I didn’t know that, and I use a Mac. So now I know. Laura: I know. I I just learned it a few months ago and it’s been life-changing. It saves me so much time, I can’t even tell you. Okay, so for this, and I don’t want to spend the time on the video because that’s going to make the video go forever. But, you can edit all the text, you can add a video talking about what your membership is like and maybe even shoot a video where you show the inside of your membership or your course, and then you can change the text here to let people know what it’s about and then this button will, you can set it up to continue to the next step in the funnel. So right now it says opens the pop-up, so that’s what the code of it is saying, but you can change that to just go to the next step in the process. And I personally would take off these social share things just because you want people to really only have one goal. Laura: Focus just moving on to the next one. Melissa: And what about the ones on the bottom there too, you can move those out as well. Laura: Yeah, you can customize anything. So, here’s really fast that button. So right now it’s set to open up, but you can make it go to any website URL, submit a form if you have something on the page which there isn’t a form on this page. Scroll to another section, so it could scroll way down, or it could show and hide something. But I want it just to go to the next step in the funnel. Laura: Because it’s going to take people to where they can purchase. Melissa: So do you just click that option or? And then you have to save it. Ok, that’s what I was going to ask. Laura: Yeah. Always have to save it before you leave. Ok, so what we can do is, ay yi yi, I know. Metadata, that’s a whole other video also. Melissa: I love meta data. We’ll do that, we’ll do that one. Laura: I know, it’s so funny. Once you start playing with it you’re like, oh yeah! There’s all these other things that you learn as you do it and then it’s good stuff to share with people. So that little button is the exit, so make sure to save it before you exit. And it’s just going to take you back to the steps which i also have on this window right here. So then the order form is what you’ll customize to actually let people purchase your item, and I think customizing that is also another full video in itself because there’s some tricks that you can do along with like adding a bump to your order. So basically let’s say you sell your membership for 197, you can add on the order form a bump which is like a one time oh just add this it’s only five dollars more and all people have to do is just click a little box and it will add that to their order. So that is done inside of the products area, but it looks like first we need to pick a template. So let’s see, order form. Ok, right now I’m on opt-in so that’s why I was like wait a second, these don’t look like order forms. So we want to go to sales..
Laura: And then there are more options. So we could actually.. oh shoot, you know what? Maybe our sales page we did an opt-in and maybe we should’ve actually picked a template for a sales page. So i think i might play with that afterwards so we can make this a really good custom thing for people to use. Laura: But for this one we definitely want it to order form so when you click that you see the templates change, and then I would just pick something that is similar to what you’ve picked somewhere else so I think I’ll do this one. Just like simple. Melissa: I like that one. Laura: Yeah, and kind of a lighter background. But you can change the colors, you can change the logo, you can change the words, the images, everything to make it appeal to your brand. And right here this button is where you do the products. So, you’ll actually create your product and the pricing right there, and then whatever it is it will automatically show up as that price inside of the order form. Laura: So that’s where you do the the product ad, and that’s where we will do your membership and whatever the price is for that. Laura: And then membership access area. So I mean, the main point of this video is I want to show people the membership inside of it so these two items are whole videos in themselves, and we’ll customize it so that when people take this custom funnel that we’re building out that it’ll look nice and they can just kind of plug and play from there. Laura: So this membership access area also has its own templates, which was under membership. And I personally like this one the most because it has a little spot where you can do another video which helps give like an orientation to people because sometimes when they get to this page they’re like oh wait what am I supposed to do? So once someone pays, they’re going to see this screen and it will prompt them to create their own login and password. Melissa: And this will be like their page that they’ll probably end up bookmarking and coming back to to login later, right? Laura: Yes. And once you’re logged in, if your computer remembers that, if you come to this it’ll just pop you right into the membership area if you’re already logged in. Laura: Yeah. So just to give you a little look at it, as it loads here..
Melissa: Yeah, just remember, you’re developing out some really cool stuff in ClickFunnels so if it takes a couple of seconds it’s totally worth it. Laura: Yeah. So you can do a couple things here like change your logo, change the colors, you can change what the words are here, just as simple as clicking in there and editing it, and then you can create a video. So what I like to do is make a video, upload it to youtube, and then you can embed it in here really easy you just hit this gear icon and there’s a spot just to put the URL of your YouTube video and it will stream it right in here. Laura: So that’s a nice little orientation. You can be like Hi, my name is whatever thanks for purchasing this membership or this course, set up your login and password, make sure to write it down and hit create your account and you’ll be good to go. Just so people understand what’s going on when they get to this page. And then to actually edit the inside now here’s our last step which is the membership area. Melissa: This is so easy. Laura: I know it’s so much easier than other stuff. And I love that it can take money along the way because everything is always so disjointed. Laura: So remember membership area, there’s different funnel templates for that in here and it looks like there are six different ones. So, I think, let’s see funnel hacks, or maybe the clean one catches my eye. I’m trying to remember which one I used in Brandon’s. I think I used this one, but I kind of like this one just because the banner looks nice with the color. Melissa: So if you guys download this funnel and you use it you can always change out certain sections. So if you don’t like this one, you saw something you like better, it’s totally easy. And ClickFunnels has a ton of how-to videos they make it really simple, so if you have any questions you can watch those if you want to know how to do something specifically that we didn’t go over. Laura: Exactly. So now that I picked it, it looks a little different this time than before. So the other ones there was like a really easy button right here to click, this one’s a little bit different so I want to explain a couple things. So the first is the login URL. That’s what you give people to log in once they’ve created their account, it’ll look very similar to this membership access thing. And then they also give you a secret URL that you could send to people if you want them to be able to sign up for free. Laura: So what I do when I’m testing my funnel out is I’ll email myself this URL, or just open it up in another browser, and create a login and password for free so i can test it and see what it looks like from the users perspective. Melissa: Oh, that’s cool. Or if you wanna let your friends or certain people have free access. Laura: Yeah, exactly, exactly. So there’s two different things here for editing. So, let’s start with right here because it’s at the top. So if you click this one, edit the membership design, so there’s two different areas that you’re going to edit. So one is the design so i just opened it in a new window this is where you can change the logo and the colors and just the way that things look on the inside of your membership. Ok, so here’s where it’s like, oh I see what it looks like! So you put your logo in there, you can add different text if you want to change out what it says here, you could have this searching thing inside the course or you could delete it out if you don’t like that..
Melissa: You can change out the colors if you want to, right? Laura: Exactly. You can change out this bit right here, like need more help, you could put a little welcome message like keep it short, you could add a photo of yourself in this image. You can edit all these things just like any sales page, any other kind of page in ClickFunnels. So you can add different elements just click the plus button and you can add in an image, or text block, or a video, a countdown timer if you had some reason for that you could maybe even put a countdown timer. Like I know Dan Henry in his class he has the next time that he’s doing a monthly group call. He’ll put a timer inside of his course so you know when the next group call is going to happen so if you have that as a part of your membership or your course, then you could do that so people know when the next call is coming. And you can definitely edit everything going on in here. So this is kind of just like where you edit what it looks like, where you actually add different elements is still back in this page so it’s right here. So you can add a new lesson section, so maybe we’d do like section 2, create lesson section. So see how that little gray is like first section, second section, and you can change the name of that. And then this button is where you add any lesson. Melissa: Ok. So the lessons go within the sections? Laura: Exactly. So you can pick which section you want it to go in. So maybe I want it to be the first lesson in section 2, so you select what section, name the lesson, you can pick a template. So they’ve got a video lesson template or research resource list template. So i’ll start with the video one. And then drip delay, so this is where you can have it not appear until a certain number of days from the person you know getting access. So if you wanted your content to drip out, then that’s where you would do that right there. And so you hit create lesson.. oh it named it lesson one, lesson one. And if you want to actually edit what’s in there, that’s when you click this right here this open editor and so this is where you’re going to actually put in the content for that lesson in particular. So for me it kind of took me a little while to figure out what was going on because how it looks is edited up there, and then what’s the actual content is edited down in this area. Melissa: That’s cool. What blew my mind yesterday was that you told me that we could have different access like we could set people up for free and they get to see certain things, and then if people pay you could have them see more things and then maybe if they pay even at a different level they see like everything or something like that? Melissa: Do we have time to jump into that? Because that’s crazy. Laura: Yes, I know. Let me see what time it is because you only have a few minutes or you have another call, so I’ll be perfect once this darn thing loads I can show you where you actually edit the content and then we can look at that. Yeah, okay cool. So here’s where you actually can edit like the lesson title, the subtitle of video if you want to put it in there, you can edit the text that goes with it, you can add resources that people can click to download. Laura: Yeah, and then you can add other other sections and rows. So this is just like the basic template, but you can add anything else you want. So this is just like a starter, but then you could add another video or an image, like anything you want. Just like anything in ClickFunnels, you can do editing of these different pieces. Melissa: So that’s the column that goes within it, so basically there’ll be something on the left-hand side that shows all the lessons that are available, then something on the other side. Yeah, okay. Laura: So what you’re editing goes right here in this right part. Melissa: Cool, okay. I get it. Laura: And then over here it’ll show up, lesson one, lesson two, and the categories will show up right there. Melissa: This is so cool. Laura: And we can actually do that at the end. Ok, so then here’s where you can actually give different access, too. So you can restrict access to an entire section so you could say first section in order for them to see it they have to have purchased whatever. Like, I haven’t built out what I’m going to call it, but let’s say they have to have purchased this product in order for them to see that entire lesson. Then you can also edit it inside of here, oh I’m sorry, that section. Let me see, I feel like, ooh wasn’t there. I thought there was a way we can actually restrict just a lesson and not just a section. Maybe it is only based on sections for where you can restrict the access. Melissa: Well maybe you have to have more than one lesson in order for one of them to be restricted or something. Laura: Oh, maybe. That could be. Melissa: So where are these prices? These are other sales pages that have been set up that people have opted into? Laura: Yeah, these are products that you make on those order form pages, so these are ones that i made in other different things. So this is not actually relevant at all to the current one but just as an example. You have to make the products first in your order forms, and then you can identify it later. Yeah, as a drop-down. Melissa: Cool. This is so cool. Laura: Yeah, so let’s see if I can open it up and see what it looks like in the same browser, let’s see if it’ll work. Melissa: So we were talking yesterday about brainstorming about how different people doing different types of business could use this, and obviously people that are in the online marketing space that create courses or have membership sites, they’re already going to know intuitively how this would make sense for them. But, let’s talk about, realtors for example, they could create a how to buy a home in whatever state they’re working in or city they’re working in, and they don’t have to charge anything it could be a really great way for them to build some authority and relationships with their potential clients. We were also talking about people in network marketing, I know you’re closer to that than I am. What are some ways that you’re seeing or hearing that network marketing or multi-level marketing people are using this? Laura: Well, I mean, though options are just limitless because you could even use this as like a free way to educate the potential client so that they are willing to buy something so you could make this completely free to log in, and then you could have like a section that are benefits of using my product, or testimonial section of different people using it, or articles proving the efficacy of whatever you’re selling. You could literally just make this a super engaging sales pitch and have people come in and engage and you know learn from videos or downloadables that you do. Or I guess for network marketing, if you’re trying to build your downline, then you could use this as almost like a course to educate people who are new and coming on so you can have different sections teaching them about the product, teaching them about sales, teaching them about follow-up, or all those kinds of things. And then like with real estate, a couple things that when you said that popped in my mind is you could even have a weekly step-by-step transaction walkthrough. So, week one, here’s what to expect, or like the first 10 days I know are a big deal when you’re making a real estate sale. So it could be like, here are things that are going to happen within the first 10 days, here’s what you need to do before the loan closes, here’s what you need to do after escrow or whatever. So you can literally build out a really clean way for your clients to understand what’s coming and make this completely free for them even. It’s just an aspect of your delivery, and it would be so helpful to people. Melissa: Yeah. And I know we were talking about doctors and chiropractors. Chiropractors could use this as a way to give more education and value to their clients and doctors, too. And you know, it’s just a way, it’s like being an author or being somebody that has a podcast or something. Having these things sets you apart in a way that others don’t..
Laura: Yeah. And it’s so much cleaner than just a bunch of junk on your website, so it’s a lot more organized. Melissa: Yeah, so it feels more authentic and real. Laura: So, I want to show, this is live. This is what it’ll look like. Of course we didn’t build in a lot of detail, but if you update your logo it would show that. Here’s one lesson that was, let’s see, I think that one came with it. So, this is a template that is with different downloadable resources, and then we made this one and this was the template with the video. So that if we had edited it, it would show up right here under that. And you can expand or retract the sections so that if you wanted just to focus on what’s underneath one or the other you could you could collapse it, so those are collapsible. Melissa: That’s so cool. And so in another video, Laura and I will also get into Facebook ads because ultimately having these types of funnels and e-courses and membership sites are amazing, however you need to get people to go to them, so we’ll be talking about that another time, too. And I think let us know, you know you can comment below wherever you see this video or we’ll have emails or you can contact us on our Facebook pages, let us know what you want to know and we’ll do a video on it. Laura: Yeah, exactly. And I think you know we’re going to wrap this video up right now, at least us talking, but we can do some edits to this to make it more customized and then attach that to the end of this video so you can see what it would look like if you wanted to download it completely for free. We’re just going to share what we make, and then you’ll have a lot less work to get it started just to run with what we’ve got with the different steps along the way with the sales page which we’ll change to an actual sales page, the order form, and the membership access stuff. So hopefully it’s helpful just to get a head start on it. Melissa: Yep, and I want to see what you guys create with this! So use the funnel, like she said it’s free, you just get to plug it in and start working on it and let us know what you create because we’re excited for you. Laura: Yeah, and if you don’t have ClickFunnels yet you do have to have ClickFunnels to use this funnel, it’s not going to work in another platform. But, you have 14 days to start a trial, so you could literally customize, don’t start it until you’re ready. Day one you could customize all of your content in there. Day two you could share it with all your friends, see if there’s any tweaks or edits, that something that you’re missing that’s funky. Day three start running Facebook Ads to it and see if it’s working, so you literally have like 11 days to run Facebook Ads to it and see if it’s working for you before you decide if you want to actually buy ClickFunnels or not, and expand it or whatever. So, yeah. It’s a good plan. Melissa: I think after we’re going through this, I think we should create our own clickfunnels membership site with these videos that we’re doing. Laura: Duh, oh my god! Ok, we’ll do that. So stay tuned for links to that, that’d be so cool. And we can make it free too, and people can just.. oh my god, duh. We should do that. Melissa: And we can also have a paid section for the advanced. I mean, why not? Laura: That’s so true. Yeah, we can just have a free version where you can access it and a paid version where you can see more of that stuff, but it will all be in the same log in. We can just restrict access for the higher level stuff. I like it. Melissa: Be sure to come back to the website, MelissaSueTucker.com/freemembershiptemplate to get your free membership template. You can get this funnel and use it either for your own clickfunnels membership site, or to create a course. I'm a Lifestyle Entrepreneur who loves people, online marketing, and making money...in that order. I believe that people and living the life you desire are more important than solely focusing on making money.